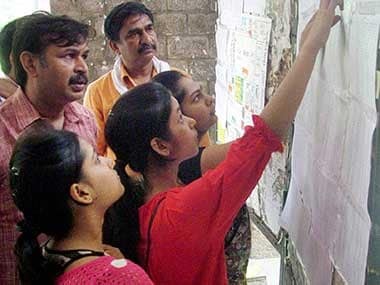 New Delhi: The first cut-off list of Delhi University for its undergraduate courses has yet again touched the 100 percent-mark with two colleges this time putting the ceiling at maximum for admission to its BSc (Computer Science) course. Admissions to the academic session 2015-16 for which the varsity had received 3.7 lakh applications, will begin on Thursday. 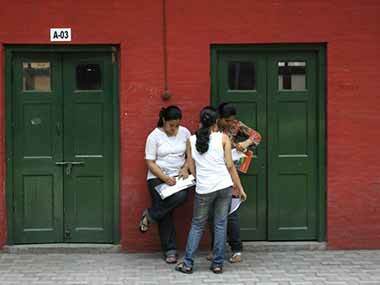 College of Vocational Studies and Indraprastha College for Women have posed a stiff competition with its 100 percent cut-off for the computer science programme for general category students. 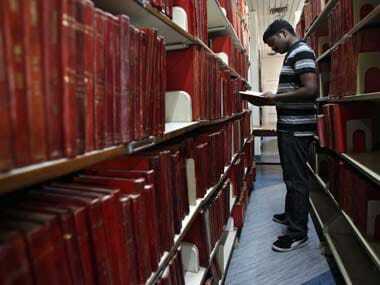 Various other colleges have set 99 percent mark-level. While Moti Lal Nehru college has kept its cut-off for BCom Honors at a "precise" 99.5 percent, Maiteyi college has kept the mark at 99 for BCom. Other colleges which have announced the ceiling at 99 percent include Bhaskaracharya College of Applied Sciences, Atma Ram Sanatan Dharm (ARSD) college, Ram Lal Anand College, PGDAV college, Shaheed Rajguru College of Applied Science for Women for Computer Science. Hindu College has kept its cut-off at 98 for Economics, 97.75 for English, History and Political Science and 97.25 for BCom Honors. SRCC, ranked among the best in the country for higher studies in Commerce and Economics, announced its cut off at 98.25 for Economics Honours and 97.37 for BCom Honors. The cut-offs for Commerce programme for many colleges were above 90 percent with SGGS College of Comemrce at 97 percent, SGTB Khalsa 96.75 pc, SGND Khalsa 94 pc, Shivaji College 97 pc, Shyama Prasad Mukehrjee College 93 pc, Shyam Lal and Aurobindo College 94 pc. For admission to Sri Venekteswara College, students are required to have 93 percent for BA programme, 97 pc for Economics, 95 pc for English and 96.75 and 97.75 for BCom Programme and Honors respectively. 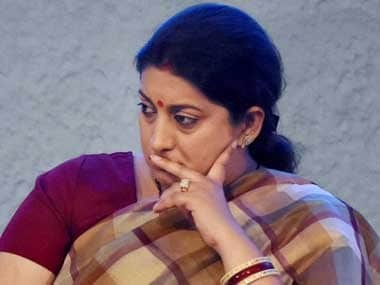 In Science, besides BSc Computer Science, the highest cut-offs are for BSc Biomedical Science with Acharya Narendra Dev announcing the mark at 96 percent, Bhaskara College at 95 percent and Institute of Home Economics at 90 pc. Hansraj College has kept its cut-offs at 93 pc for Anthropology, Botany (94 pc), Chemistry (97.33 pc), Geology (95.33 pc), Maths (97 pc), Physics (97.33 pc) and Life Sciences (95 pc). For admission to Ramjas college, the students need to have 92 percent marks for BA Programme, 97.75 pc for Economics, 97 pc for Political Science and 96 pc for English and History. Miranda House, one of the prestigious colleges of the varsity, has kept the ceiling at 96.67 pc for four of its courses including Chemistry, Mathematics, Physics and Zoology. None of the colleges have imposed any extra eligibility criteria as announced by the varsity earlier. The varsity has announced that the formalities for admission under first cut-off list needs to be completed by 27 June upto 1 pm. The second cut-off list will be announced on 30 June.